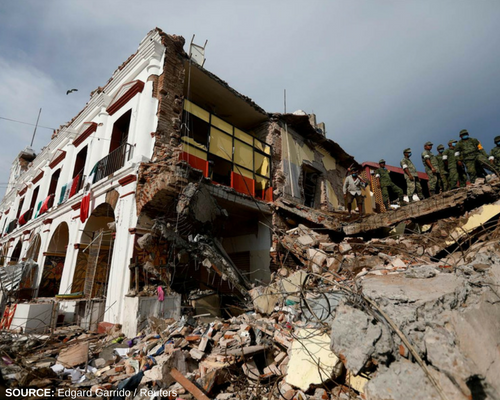 On September 7th, an 8.1 magnitude earthquake hit Mexico's southern coastline. Infrastructure was severely damaged and over 100 people are reported to have perished as a result of the earthquake. On Tuesday, September 19th, a 7.1 magnitude earthquake hit Mexico, close to 400 miles away from the previous earthquake's epicenter. Over 200 people have died as a result of the 7.1 magnitude earthquake, leaving it as the deadliest earthquake in over thirty years. In addition to the destruction brought on by both earthquakes, Mexico is also facing severe damage from Hurricane Katia, a Category 1 storm which struck the east coast of Mexico two days after the 8.1 magnitude earthquake. Charity Navigator has compiled a list of highly-rated organizations responding in the aftermath of the earthquakes and hurricane and providing assistance to the communities affected. Donors can designate their donations to the cause on the organization's website. All listed charities have made their designation policies available on their respective websites.